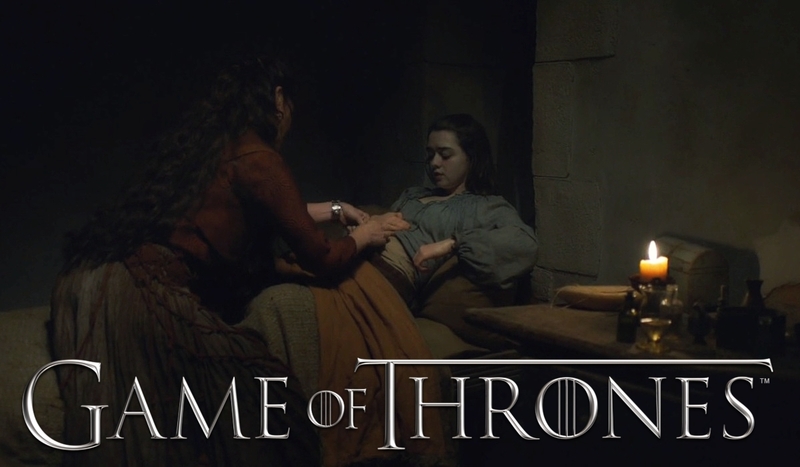 Lady Crane returns to her chambers to find a wounded Arya hiding inside, and helps stitch her wounds. She tells Arya that thanks to her warning, she mutilated her would-be killer Bianca’s face before kicking her out of the acting company. She then offers to have Arya join them, but she refuses, saying that she intends to travel west of Westeros to see the edge of the world. LADY CRANE: The company is moving on to Pentos soon. You should come with us. LADY CRANE: Why not? Got a feeling you’d be good at this sort of work. And besides, we need a new actress. ARYA: I don’t think I could remember all of the lines. LADY CRANE: Come with us. What’s left for you here? ARYA: You wouldn’t be safe. Not while she’s looking for me. ARYA: She doesn’t have a name. LADY CRANE: Where will you go? ARYA: Essos is east and Westeros is west. But what’s west of Westeros? LADY CRANE: I don’t know. ARYA: Nobody does. That’s where all the maps stop. LADY CRANE: The edge of the world, maybe. ARYA: I’d like to see that. What’s that? LADY CRANE: Milk of the poppy. ARYA: I don’t want any. LADY CRANE: Sleep is the only way you’ll heal. Trust me, if my soup didn’t kill you, nothing will.